The James Clemens, Jr. House as it appears today, with its portico removed. What is going on with James Clemens, Jr. House? Attend a lecture by Michael Allen, Director of the Preservation Research Office and hosted by Landmarks Association on the status of the centerpiece of Paul McKee’s NorthSide development on Thursday, May 10th at 6:00 PM. 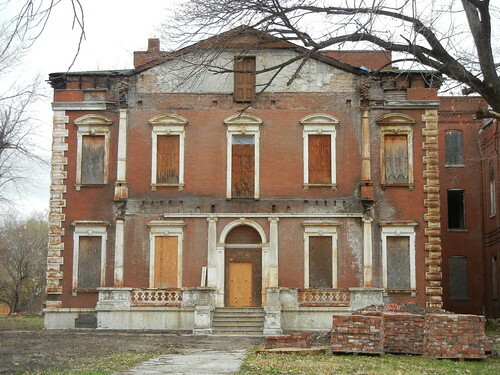 The Clemens House, constructed in 1858, is one of the few antebellum Greek Revival mansions in St. Louis and is the centerpiece of Paul McKee’s proposed NorthSide project. However, after removing the cast iron portico from the facade, the status of the project now appears unclear. Michael Allen, Director of the Preservation Research Office, will reprise his lecture “The James Clemens House: Past, Present and Future” which he delivered at Landmarks’ office during Preservation Week 2009. The lecture will include an update on the current status of the Clemens House. The lecture will be held at Architecture St. Louis located in Landmarks’ office at 911 Washington Avenue, Suite 170. The lecture will begin at 6:00 PM and is free and open to the public.